It's getting HOT outside and that means popsicles by the pool in my family. We love otter pops, but my kids have a hard time holding them when they are so cold. Heck, so do I. So, I break out the napkin/paper towel and wrap them. This works fine in the yard, but at the pool, not so much...everything gets wet and they make a mess of the paper towels. We have instead grown accustomed to dipping them in the water to let them defrost a little and that does the trick, but they don't last as long that way. Here's an even better alternative...plus they are so CUTE personalized! 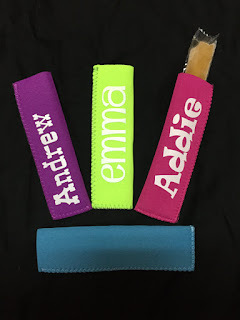 You can order these neoprene personalized popsicle holders for just $4.00 each. They are handmade and made to order. They come in the colors pictured above: purple, green, pink and blue. The names are available in a variety of colors including glitter options. Order yours here!